I was wary at first because of the subtitle, which made it sound like the get-rich-quick stuff of infomercials, but I overcame that initial reaction and requested a Kindle copy. I’m glad I did. And I’m glad that somewhere through the process, John decided to take his own advice in the naming of his book. More on that in a bit. Because of the patient-oriented nature of my day job, I have focused much more on general consumer platforms like Facebook instead of LinkedIn. Our Human Resources department has used LinkedIn successfully for recruiting. 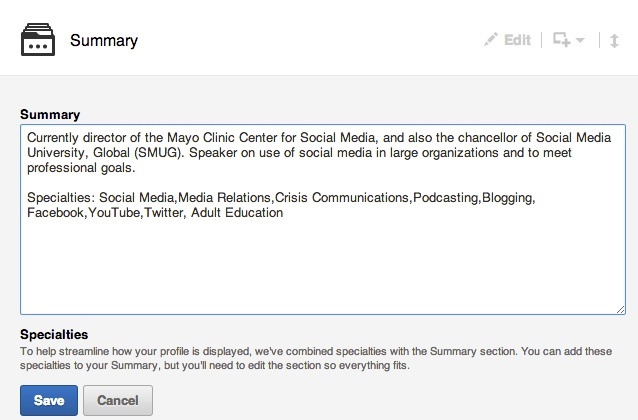 But since the audiences I have been pursuing are mostly patients and consumers, as opposed to “B2B” as they say in the biz, I have had a profile, but haven’t spent much time personally in LinkedIn. So it was good to get perspective from someone who has. One of the main points John makes is that your LinkedIn profile should be client-facing and framed in terms of what you can do for clients. It’s not about you. And he also gives some concrete suggestions for how to implement this philosophy. 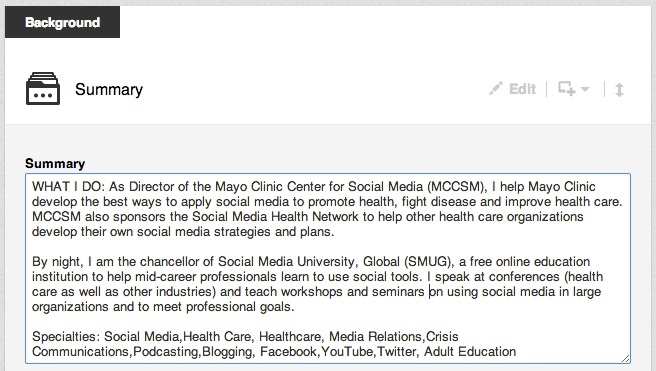 So here’s how I used his advice on my own LinkedIn profile. Those are three positive changes in my profile in just the first chapter. The combination of the client-facing mindset and some practical tips makes this a good resource. While that might appeal to some, the new title is much more oriented toward benefits for the reader. Linked In Riche$: How to Leverage the World’s Largest Professional Network to Enhance Your Brand, Generate Leads and Increase Revenue. And if you’re looking for a quick read with some helpful tips on using LinkedIn, I think you’ll find it worthwhile. Lee thanks for the nice the review! And LOVE the improvements you made to your profile as a result of reading Chapter 1. Also as you pointed out, I missed the mark with the initial subtitle and have changed it after getting WAY too many people having the same initial reaction you did. My point in the original subtitle (How I Made $135k in 90 Days using LinkedIn) wasn’t to brag or offer “get rick quick” advice, but rather to try and make it clear I had some proof and success with LinkedIn to draw from in writing the book. As you know, so many people will claim authority and say they’re a LinkedIn Expert or whatever else. So my thought was I wanted to show my authority and relate the unique and exciting story of my own experience on LinkedIn as part of the process. But like you mentioned, I neglected my own advice as the subtitle wasn’t nearly “client facing” enough. Needless to say the new subtitle is working much better. I appreciate too you pointing out that this is NOT a “get rich quick” type book or anything like that! Thanks again for the review and especially for taking the time to check out the book! Thanks, John. The original subtitle was OK, and as you say, it’s good to offer proof of what you’re claiming. Assertions are easy, so telling the true story of your experience is important. It’s good that you can back it up. 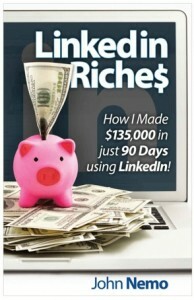 I think your book is going to help me get more out of LinkedIn, and that others will, too.